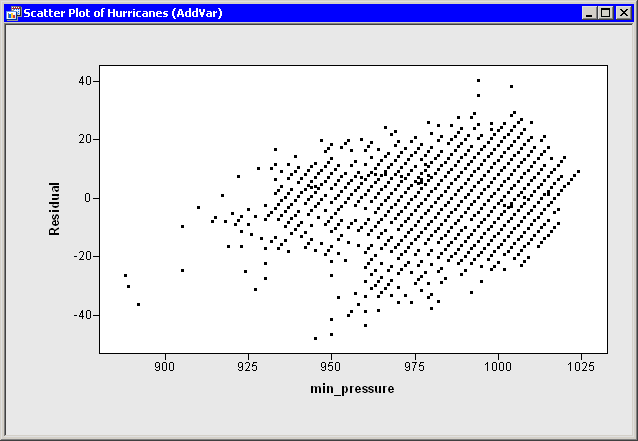 These statements open the Hurricanes data set from your PC and write the wind_kts and min_pressure variables to a server data set called Work.Hurr. These statements are explained in Chapter 2, Reading and Writing Data. In the Chapter 4, Calling SAS Procedures, you called the REG procedure with the Work.Hurr data and viewed tables and statistics in the output window. This time, you use the OUTPUT statement to create an output data set that includes the residual values for the regression model.